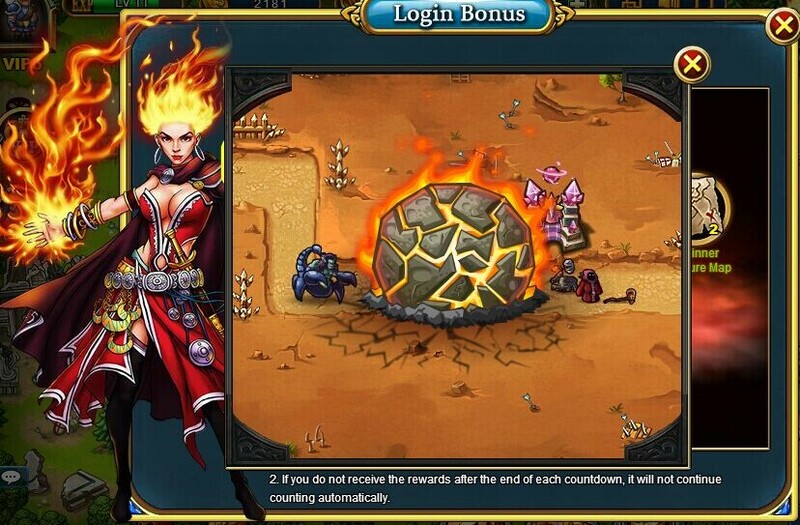 Login Bonus - Stay online for a certain time each day to earn Gold, Medals, Runes and more! 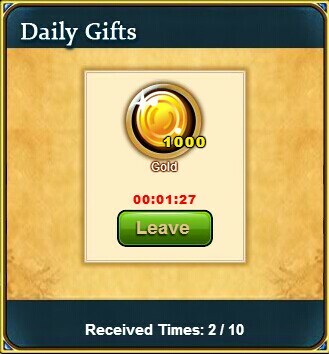 Daily Gifts - Use a certain amount of Diamonds each day and you'll reap every more rewards and great items. Friends - Invite a certain number of friends to play alongside you to unlock a fantastic prize. Friends can send each other War Drums, Boost Runes and other awesome gifts! 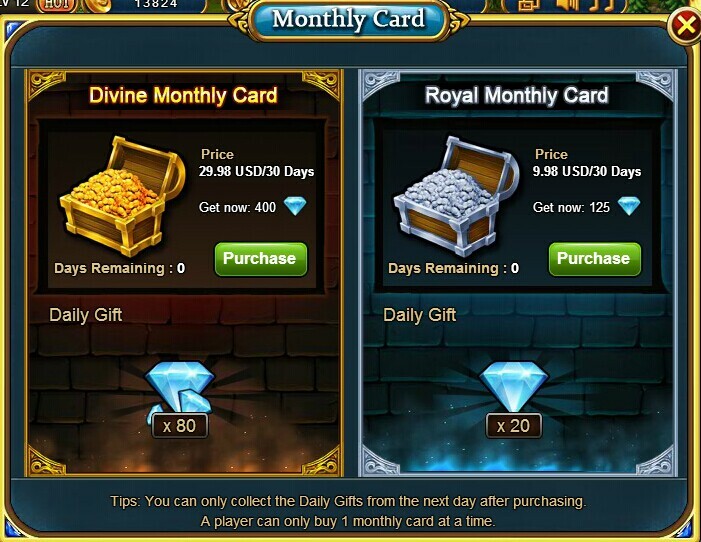 Monthly Card - Save time with a Monthly card and you'll be delivered free Diamonds, daily. The returns from a Monthly Card are worth several times more than the price of the card itself. Free Hero - Buy a Hero here and the Diamonds that you spend will be returned to you before the end of the month! 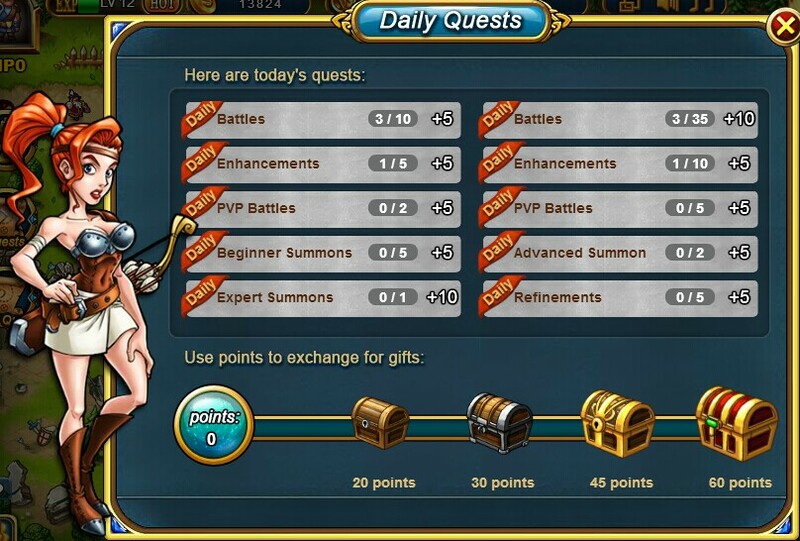 Daily Quests - Complete certain quests and you'll be in to win War Drums, Gold, Medals, Summon Tomes and more! Arena - This is the PvP Arena, where you can boost your battle rating. There's a ranking prize available daily, and crystals earned from the Arena may be exchanged for rare items. Tavern - After a certain number of waves, the Tavern becomes available and it's here that you can draft the world's toughest warriors. 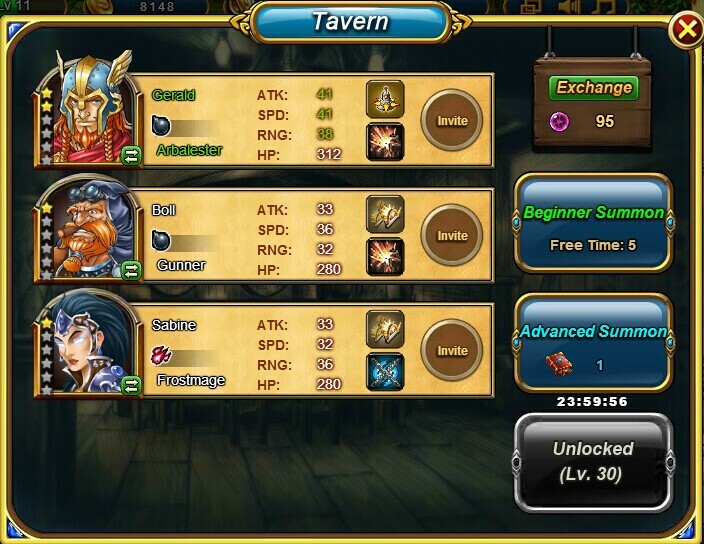 Heroes are split into 6 different categories, with two 1-4 level Heroes available at the beginner Tavern - and a chance at up to FOUR 4- and 5-star Heroes at the advanced Tavern. 6-star Heroes are only available through Trans. 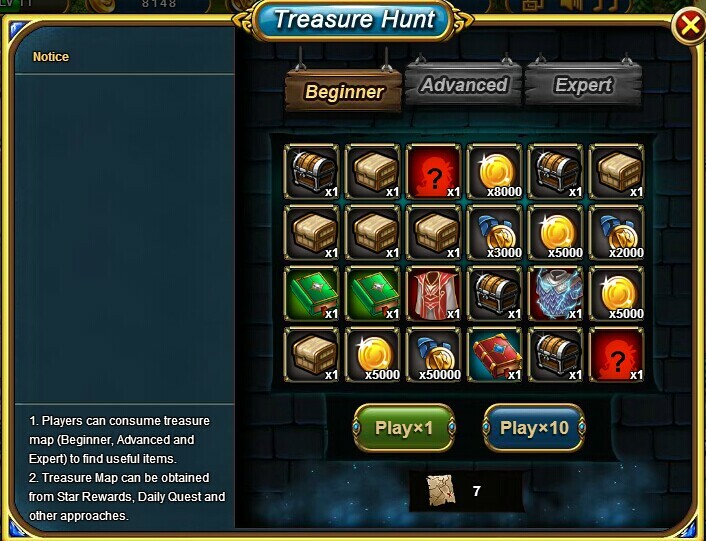 Treasure Hunt - Use different treasure maps to find different weapons, Gold, scrolls, medals and more! Beginner treasure maps yield just 1 item, but advanced treasure maps can generate up to 4 items each time. 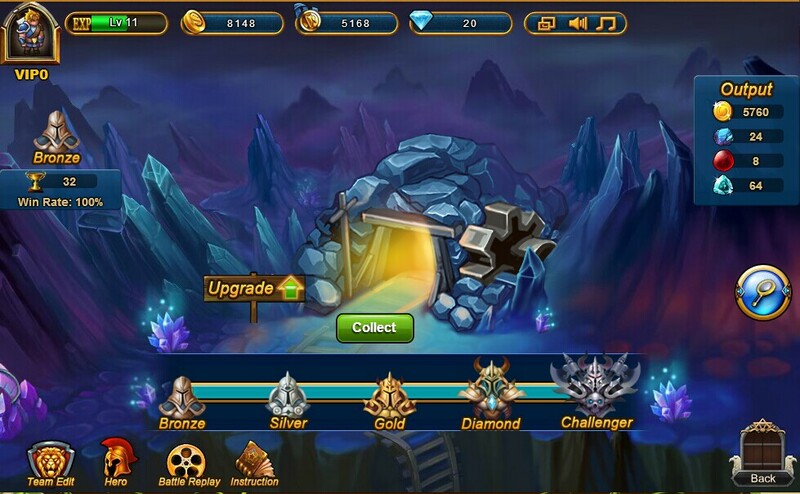 Explore - Earn Gold and Forgestones here. High level Explore even allows you to mine Diamonds! But watch out for attacks from other players - if another player spends Gold to search for your mine and defeats you in battle, you'll lose a portion of your earnings. 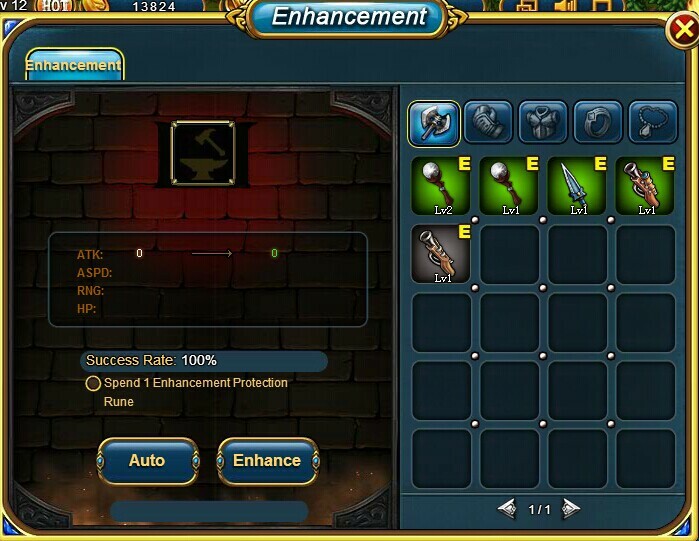 Enhancement - Each item is bound to a single class, and may not be used by any other classes. Check the small icon on each item to see whether it matches your particular class. Each Hero may carry 4 items, and these may be improved through Enhancement, Refinement, and boosting the star-rating. Craft your perfect weapon and take out foes in a single shot! Enhancement costs a certain amount each time, and your character level forms your Enhancement level cap. There's a 50 - 100% success rate that changes once every half an hour; we suggest Enhancing once the success rate is high to save you from spending more Gold. Like Heroes, items are divided into 5-star categories.